This Month´s Topic: Do orcas really live as long in captivity as in the wild? Home / Articles / Columnists / Earth Talk Q & A / This Month´s Topic: Do orcas really live as long in captivity as in the wild? I’ve been seeing this ad on TV a lot by SeaWorld claiming they don’t take orcas from the wild and that orcas live just as long in captivity as they do in the wild. Are these claims true? “Our animals are living as long as wild populations,” says Dr. Todd Robeck, Vice President of Theriogeneology at SeaWorld and the primary author of the study. “The data shows without a doubt that our animals live as long as the ones in the wild.” Additionally, the study indicates that average calf survival rate to age two in the Southern Resident killer whale population is 79.9 percent - less than SeaWorld’s 96.6 percent average. 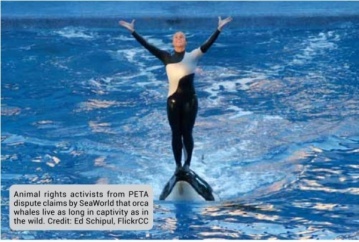 CONTACT: SeaWorld, www.seaworld.com; Blackfish, www.blackfishmovie.com; PETA, www.peta.org.